Shortly before Christmas, Laterna magika ensemble prepared a treat for families with children. The new production Zahrada (The Garden) is supposed to remind us of long-forgotten childhood adventures and fantasies. The preparations of the project took more than half a year, with the creators investing no small ambitions and personal memories in it. The ballet is inspired by and very loosely based on the eponymous book by Jiří Trnka. However, the central themes remain unchanged: exploring mysterious corners of a garden behind an old stone wall which the book’s protagonists enter through a rusty iron gate. For his 1962 book of illustrations, Jiří Trnka did not only created the pictures, but also authored the story of five boys who experience unexpected encounters in a secret garden. They step into overgrown grass, reaching high above their heads, and see a gnome standing behind a bush. Their journey through mysterious places is about to start. Also, the creative team behind Laterna magikas’ new project invites us to join an exciting expedition into the realm of fantasy (but without elephants and dogs that appear in the book). At the top of the stairs, in front of the New Stage (National Theatre) auditorium entrance, Tomcat with a giant moustache (David Stránský) welcomes the visitors from his booth – he resembles a grumpy keeper of the eerie preserve that the authors of the script try to uncover. Instead of five little mischiefs we meet Tereza (Zuzana Herényiová), Bohouš (Alexandr Sadirov), Adam (Ondřej Martiš) and Tonda (Viktor Svidró). Their adventures unfold in a space full of objects: a bath or a kids’ bicycle that instantly turns into a beamer projecting childhood videos of the protagonists who return to the garden as adults. A transparent cocoon becomes an ant-hill and a tree becomes a vespiary. An old bath transforms into a cranky boat, in which the four friends sail and only their gestures and strong mimics express how frustrated they are by the unhappy situation. The clear, solid framework of the piece is built by the music score by Jan Šikla as well as the scenography and costumes. Tereza Bartůňková has designed excellent film animation and her quaint climbing plants will attract your attention. The audience can see the garden overgrowing with sprouts and flowers until the earth is completely swept off the white floor. 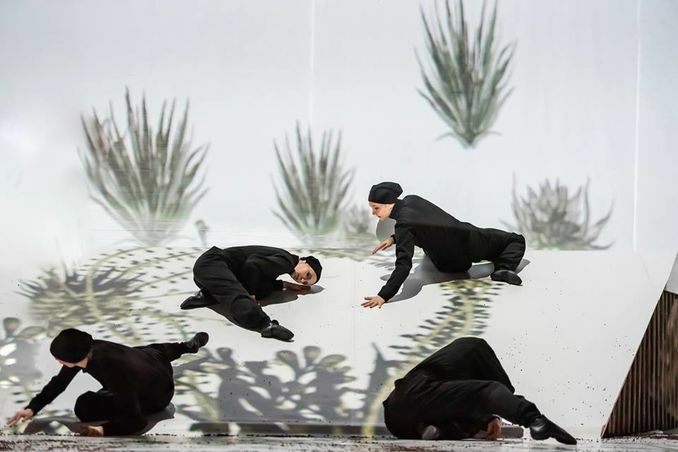 The black earth is part of the visual concept, it spreads all over the stage, creates spiral ornaments and makes a spawn for vermin danced by a changing number of indifferent black hooded figures (Adéla Abdul Khaleg, Pavlína Červíčková, Tereza Hloušková, Eliška Kolárová, Tamara Kšírová, Libor Kettner, Lukáš Nastišin, Jakub Sedláček). First, they try to recollect the decaying limbs of the gnome,later in the piece they complete stage actions or changes, e.g. they let Tereza “fly” in the air or they push a hedgehog-projecting wheel on a diagonal. The three male characters are not prominent in any way, though the music score offers piano and strings melodies and a rich orchestration full of impulses. Neither Tereza’s part and its choreographic texture are convincing - the dancer often balances on the edge of the upstage ramp which is scantily used for developing stage actions, and so is the silver and smooth downstage decline. The Garden is a colourless kaleidoscope of images that appear in photographs in the programme along with captions such as: game, garden, sail, zen, night, memories, death, journey… However, the result is a stream of faded reminiscences, represented (among other things) by large plastic bottles with objects inside them, which are sent around the audience. Inzen, female dancers are revolving in crinolines that throw shadows on the horizon; in one of the scenes paper swallows are fluttering above the viewers’ heads and appear in the projection too. The ending is truly surprising – Tomcat bursts onto the stage, shouting and chasing the curious intruders. The hour and a half duration (100 minutes with one intermission) was not the best choice either, as it reveals all the weak points of a piece that relies on the visual side, merging film projections and mapping with onstage actions – but it all happens without any deeper or refined fusion of dance and multimedia. The creators obviously gave up on contrasting dramaturgical or dramatic articulation, and so it was not easy to hold the audience’s attention throughout the monotonous stage dynamics. Adults and especially children might have found the conception very unclear. The choreography itself is a bit languid: the four protagonists walk, run, or make gestures with more or less compelling expression. The chorus in black body suits often get lost among all the sets and projections and sometimes disturb the visual beauty of onstage screens. The choreographic levels - up, down, to the sides, forward and backward - only vary in the duet of Tereza and one of the dancers which awakens you from lethargy, though not even this hopeful moment brings any deeper choreographic inventions. Tomcat would surely deserve more rounded style to resemble a real cat, not a confused old man running around the stage. The above-mentioned imperfections make it hard to evaluate the dancers’ performances, because David Stránský, Zuzana Herényiová, Alexandr Sadirov, Ondřej Martiš and Viktor Svidró were not given any proper choreographic material to develop their roles and integrate them into a refined, meaningful visual-dance context. In this respect, the Garden produced a poor harvest. Written form the premiere held on 21 December 2018, at New Stage of the National Theatre Prague.